Thousands of players have qualified to the MILLIONS Online tournament. They will compete in the biggest online event with $20,000,000 guaranteed. The winner can hope for 2.5 million dollars. Would you like to join those who will play the MILLIONS Online? It's simple. 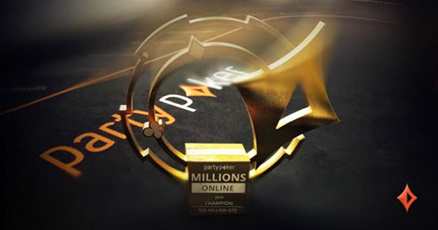 Just click the tournaments in PartyPoker lobby and chose MILLIONS Online category. There you will be able to pick the right buy-in and day for you to play a satellite. The tournament will kick off on Sunday, November 25th at 8:00 p.m. (CET). It will be day 1A. At the same time on Thursday, Nov 29th we will start day 1B. Day 1C is planned for Sunday, December 2nd, and day 1D will take place on Monday, December 3rd. After the last day (in Turbo format) players will return December 4th. They will start playing at 8:00 p.m. Then on Wednesday, Dec 5th also at 8:00, we will start the final day when the winner will emerge and scoope the millions he or she deserves. Actually as many as four MILLIONS Online winners will be millionaires and the main prize is 2.5 million dollars. Second, third and fourth places guarantee respectively 1.75, 1.25 and 1 million USD. Simply getting to the final table guarantees $200,000. We can expect 400 places paid, and min cash will be $10,000. $20,000,000 guaranteed prize pool assumes there will be at least 4,000 registrations, each buy-in of $5,300 buy-in. No other online poker platform has ever before set such an ambitious goal. PartyPoker, PartyPoker Live and MILLIONS series will take its place in poker history after this one, this is for sure. Some players expect a huge chance due to a possible overlay. MILLIONS Online will be the biggest online event in the history of poker on the internet. Last year's edition broke a record at PartyPoker, by creating a prize pool worth $5.1 million. PartyPoker decided to set another record and they multiplied the prize pool four times.